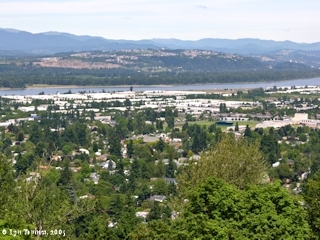 Click image to enlarge Prune Hill, Washington, from Chinook Landing, Oregon. Lady Island is the low trees in the middleground. 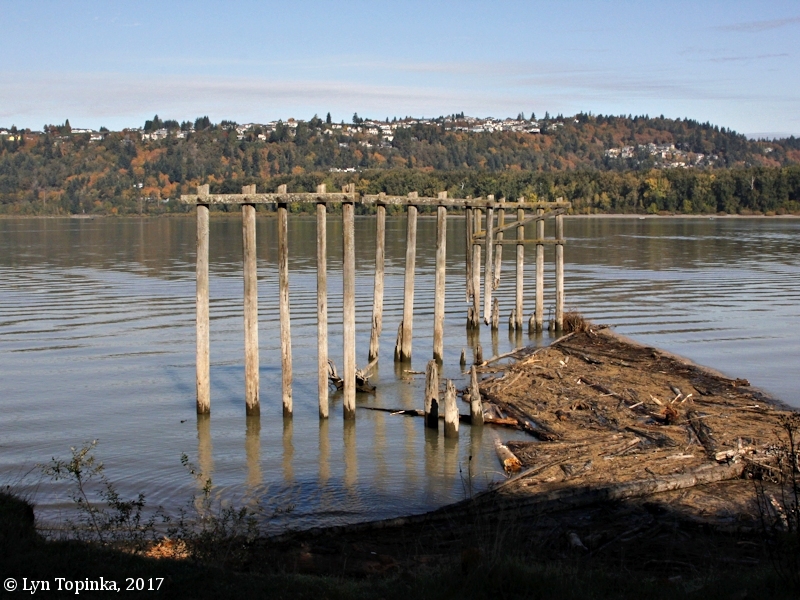 Image taken October 25, 2017. 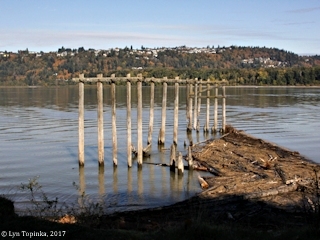 The base of the Boring Lava cone "Prune Hill" can be seen rising behind Lady Island and Camas, Washington, with its high point at elevation 751 feet. 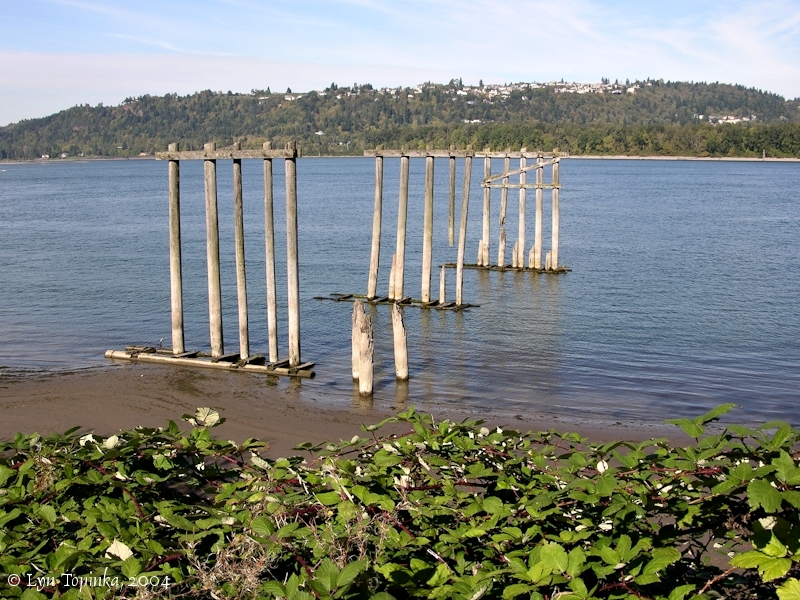 It lies at Columbia River Mile (RM) 118. The first name given to this area was "Rock Quarry District" for the large quarry located on the Columbia River near Fisher. The name "Prune Hill" was adopted in 1900. In the 1880s and 1890s the west slopes and top of the hill were planted prune trees, with a Mr. Boyer being the first man in the area to put in a big prune orchard. Other settlers followed. At one time there were seven dryers in the Prune Hill area alone (none remain today). By the turn of the century Clark County, Washington, was known as the prune capitol of the world, a title which continued until the Depression when the bottom fell out of the prune market. Today only a few prune trees remain. 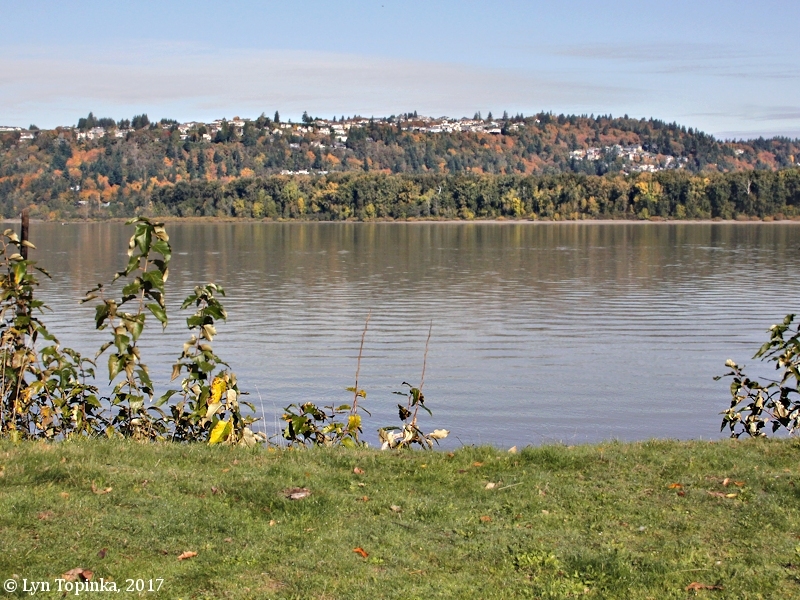 Good views of Prune Hill can be had from Chinook Landing on the Oregon side of the Columbia. Views can also be had from another Boring Lava Cone, Rocky Butte, located south of the Portland International Airport. 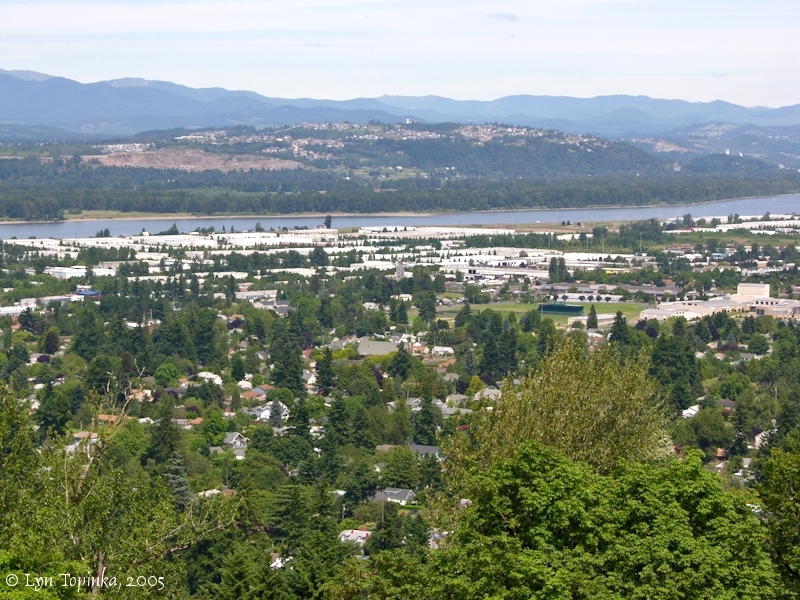 Click image to enlarge Prune Hill, Washington, from Chinook Landing, Oregon. 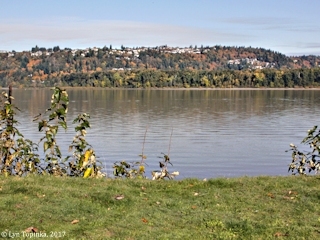 Lady Island is the low trees in the middleground. Image taken October 11, 2004. Click image to enlarge Prune Hill, Washington, a Boring Lava Cone, as seen from Rocky Butte, Oregon Image taken June 15, 2005. 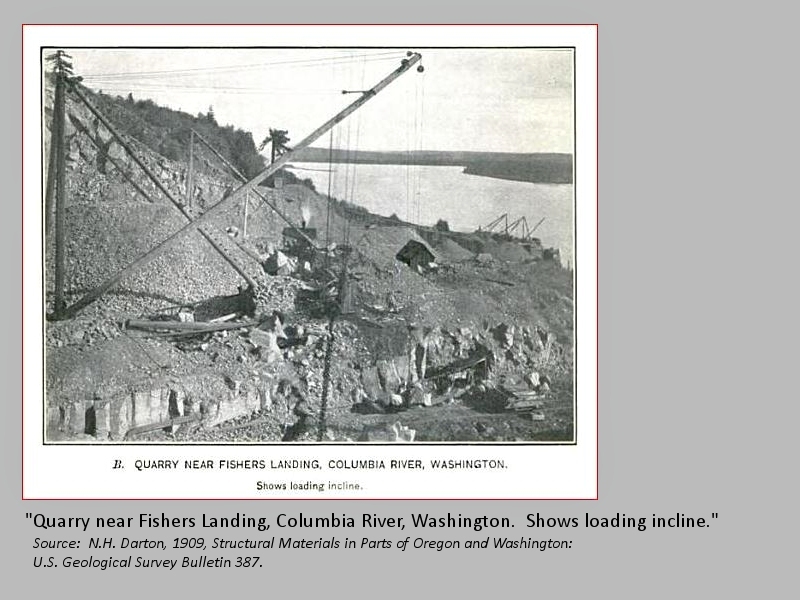 Also known as "Fishers Quarry" or "Fishers Landing Quarry", the Fisher Quarry lies at Columbia River Mile (RM) 116. The quarry began operations about 1881 and is still in operation today. 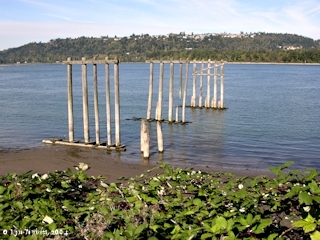 Early rock went for the the Gray's Harbor jetty and the major part of the Columbia River jetty and rock today is used in road beds and landscaping. Fisher Quarry is located in basalt flows which erupted from a vent located on the slope of Prune Hill, a Boring Lava cone. 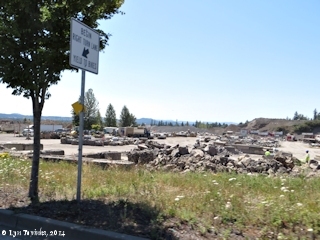 Fisher Quarry is located a little over one mile east of Fishers Landing and approximately 3.5 miles west of the community of Camas. The edge of the Quarry can be seen from Washington State Highway 14. Click image to enlarge HISTORICAL PHOTO, Fisher Quarry as seen ca.1909. 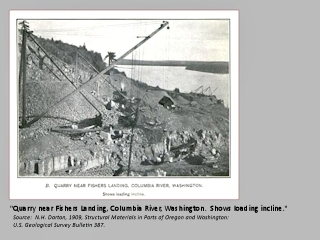 "Quarry near Fishers Landing, Columbia River, Washington. Shows loading incline." Source: N.H. Darton, 1909, Structural Materials in Parts of Oregon and Washington: USGS Bulletin 387. Click image to enlarge Fisher Quarry as seen from SE 192nd Ave, Vancouver, Washington. Image taken July 31, 2014.